For reasons best known to themselves, the US Army only adopted one armored car during WWII – the 6 x 6 M8 Greyhound and its M20 armored utility vehicle derivative. But the US did develop both 4 x 4 and 8 x 8 variants, with the 4 x 4 version being produced as the T17 series. The British named them Staghound and they saw combat as part of the Commonwealth forces. 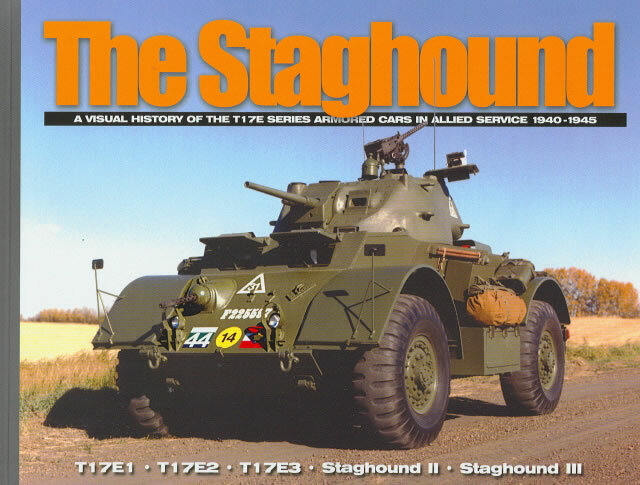 The prolific Mr. Doyle has provided a short two-page thumbnail history of the Staghound in US development and a very lovely selection of photos of the Staghound family under construction, in service and in preservation over the course of this book. 102 pages cover the most widely used variant, the T17E1 Staghound 4 x 4 armored car; 7 pages cover the T17E2 twin .50 caliber antiaircraft variant; two pages cover the stillborn T17E3 75mm HMC variant; two pages the Staghound II 75mm tank howitzer variant and nine pages the Staghound III with the upgunned Crusader turret with a 75mm gun. Most useful to modelers is the first section, which has a lot of photos covering the construction of the T17E1 (e.g. Staghound I) variant and its details. Canadian armour fans will enjoy the book as it has a lot of coverage of the 12th Manitoba Dragoons in action with the Staghound I. (For those interested in a more in-depth history of the vehicle I suggest “The Staghound in Canadian Service” by Roger V. Lucy, Service Publications, Ottawa, ISBN 978-1-894581-37-). The book includes the Ordnance plans for a Staghound I which appear to be 1/35 scale but are not identified as such, so you may wish to measure them first before using. Overall this is a handsome book which is going to make anyone with a Bronco or Italeri kit happy as it answers most of their modeling questions. Thanks to Pat Stansell for the review sample.